Twitter can be a great platform to establish your brand online, build a community and spread the buzz about what you do. But to really make the best of Twitter, you need to make sure you are not still making these 5 mistakes. Are you still making these 5 #Twitter mistakes? Whether you are new to it or not, Twitter can be tricky sometimes. But do not worry, it is quite easy to avoid the basic mistakes which will decrease the impact of your efforts. Just read on! It seems basic but there are still so many of us doing this mistake. If you start your tweet with a username, then only you and that username will actually see your tweet! The trick here is to add a dot “.” before the username to make sure your tweet goes public and can be seen by a maximum of users. Unless you really mean for only the specific user to see your tweet. When starting with a username, add a “.” before to make sure everyone can see your tweet! Do you almost always follow back someone who follows you? Well, although this is a nice and polite gesture, it is not very constructive, and not necessary. Keeping your timeline relevant is one of the most important aspect of a good Twitter strategy. Following whoever followed you will just add noise to your timeline and may result into you missing out on some important tweets from people you really meant to follow. Following back everyone on #Twitter is not constructive and not necessary. 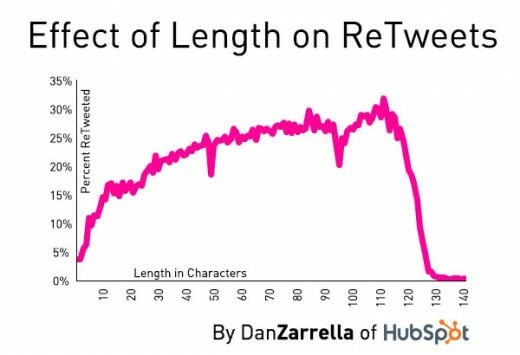 Shorter tweets drive higher engagement rates. Not only longer tweets are more difficult to read, but users on Twitter like to get to the point quickly. In fact tweets that are 100 to 120 characters seem to get many more retweets than the longer ones. Also keep in mind that someone may want to RT mention you and in this case, it is best to leave enough characters for your username. Tweets that are 100 to 120 characters seem to get many more retweets. Even if we talked in the past about the benefits of sharing full URLs on social media, Twitter is a different case as your characters are numbered. Use a URL shortener which will also provide you with analytics on CTRs. This is the best way to understand what your audience likes and what you should be talking more about. Having a Twitter account and almost never tweet gives a bad image for your business. Tweeting too much, on the other hand, can become annoying for your followers. Always remember you are dealing with humans. Make your tweets interesting and send out just enough information to keep them engaged. Check out more resources on Twitter here! This post was inspired from an article originally published on the Twitter Counter blog.